Two years ago, Rinita Vanjre was in Paris searching to no avail for a restaurant or eatery to have a meal in because most of them were closed as it was Christmas Day. Last Friday, it was Christmas yet again but, this time, Vanjre sat in a terraced house in an estate near the north of Singapore, buffered on both sides by the Upper and Lower Seletar Reservoirs. It was not her home. 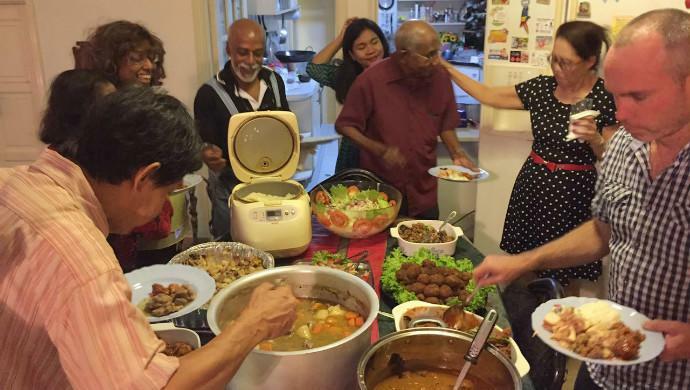 On that night, Vanjre talked to e27, as a BonAppetour-registered host and the matriarch of the house was in the kitchen whipping up a storm for family and friends, and guests who have signed up for the festive dinner through the Singapore startup’s website. BonAppetour, a community platform that helps travellers seeking a home-cooked meal find local hosts who can provide that experience, is the result of Vanjre’s bleak sojourn through the Parisian streets with Inez Wihardjo, her Co-founder. The two were then undergraduates on a holiday in Paris, and being budget travellers shaped their initial vision for what BonAppetour would be. But they realised that making BonAppetour a platform that is dish-focused or one where users go to to find hosts who can prepare and feed them specific dishes was a tough sell because of the array of options there already was in culinary destinations like Italy and the relative convenience of these options. Vanjre and Wihardjo decided to change tack. “There’s a better scope as a full meal experience with wine and everything included and, on top of that, our margins are higher. 15 per cent of a plate of lasagna is peanuts but 15 per cent of a plate of a four- or five-course meal is something, not peanuts,” says Vanjre. Hosts now offer prospective guests a full meal experience that can include desserts and drinks and even comes with cooking lessons if the guests so fancy. For the cooking lessons, the guests take part in the cooking with the host before they all sit down to the meal. For the dining experience, BonAppetour imposes a service charge on the diner. This service charge is 15 per cent of the cost of the meal, which varies depending on the host and what the meal entails. The service charge goes towards BonAppetour’s revenue. On this occasion, the guests who booked the meal through BonAppetour each pays S$69 (US$48.83) — S$60 of that goes to the host and S$9 that BonAppetour keeps as service charge. It was a tad more expensive than usual because of the Christmas menu, which included roasted stuffed turkey, pork vindaloo, lamb stew, beef curry, fish cutlets and fruitcake. The food, however, was not the only thing the diners got for the price. Key elements of BonAppetour’s business model are the emphases on building communities and encouraging social interaction. “The whole point is in discovering new things: Cultures and food. I think this provides a good platform where these kinds of interactions can take place,” says Vanjre. Outside, on the patio, I joined a group of nine, who, led by a guitarist and another on the tabla, were singing classics such as Eric Clapton’s Wonderful Tonight. Amongst them were a lawyer from California, a financial analyst from Japan, a life coach and counselor from Sri Lanka, a Turkish lady working in auditing, and a Macedonian lady on a pit stop in Singapore as part of her travels through Southeast Asia. “I think it’s the company. When you are seated at the dining table or in a home with other people, the kinds of conversations that come out of that is really beautiful and people end up becoming friends on Facebook. I think that solidifies this whole experience as a memory,” says Vanjre. Having been a traveller herself, Vanjre understands what they are looking for. Experiencing new cuisines and meeting locals is a lifestyle, and catering to this lifestyle requires her to build a community that desires it. Guests aside, the hosts form an integral part of this community. Vanjre has had to spend time to meet them and explain their roles in the community she is fostering on BonAppetour, even flying to Italy in January this year with Wijardjo to meet with 150 hosts individually. The pair viewed Italy as their primary market and spent three months hopping from city to city, which included Rome, Milan, Florence and Venice. The trip was especially crucial after many of these hosts, who had been early adopters of BonAppetour, were not accepting bookings from prospective diners. The problem was that they had signed up as hosts before BonAppetour launched its website as it currently is in December 2014. There had been more than a year’s lapse from BonAppetour’s landing page — which was created in late 2013 — and the beta version of its website — which ran from January 2014 to November 2014 — to its current website. “When we were taking bookings from travelers, the hosts would go missing. When we called them (the hosts), they were like, ‘What’s BonAppetour?’ because they signed up so long ago,” says Vanjre. Some friends saw their trip as frivolous, suggesting that the pair could achieve the same purpose with Internet calls, but they were ultimately unable to dissuade Vanjre and Wihardjo. “We felt there was this gap. We had a very superficial relationship with our hosts, which was why we decided to meet them. It’s a world of difference when you Skype somebody and when you actually go and meet them. I think that was a pivotal moment when we actually went to meet our hosts one by one and built a relationship,” says Vanjre, who counts newly-recruited hosts amongst the 150 she and her co-founder met in Italy. These hosts have to meet a set of requirements including cleanliness and hygiene, food preparation, and social etiquette. “We spend a lot of time educating them and giving them feedback on what to improve in terms of hosting style. Some hosts are just good naturally, some need a little improvement,” says Vanjre. The trip was a pivotal moment also because, Vanjre says, the acceptance rate of meal bookings went up by more than 70 per cent. While Italy and other European destinations were an early focus for BonAppetour, the startup has not neglected other regions. It also has hosts listed in Africa, Asia, North America, Oceania, and South America. “We started off with Italy first because it’s one of the most popular culinary destinations for tourists. After we raise our funding, we plan to expand into 50 other culinary hubs around the world,” says Vanjre. BonAppetour is targeting to close a seed round of US$300,000 by April 2016. The 50 cities include Hong Kong and Japan. BonAppetour’s expansion plans include catering to the desire of people to find and book a meal on the go and at the 11th hour. To do this, BonAppetour is aiming to build an app with an instant-booking feature. “We notice that a lot of our bookings happen at the last minute, between one to three days lead time. Some hosts require more time [to prepare a meal], others are readily available. So, with this app, we want to launch an instant-booking feature which only showcases hosts who accept instant bookings,” says Vanjre. The app and the instant booking feature will help BonAppetour increase its conversions by up to 40 per cent, Vanjre estimates from the number of bookings that have had to be turned down because they were made too close to the meal. While Uber relies on drivers to make the platform work, the service is a utilitarian one. Most, if not all, of these drivers do it arguably because it is a source of income and nothing more. It is different for BonAppetour if the words of Delsy Miranda, the night’s host, are anything to go by. Hosts like Miranda are part of the reason why BonAppetour dining experiences have received rave reviews, even if those meals are in locations that are tourist attractions in themselves and can easily overshadow the meal. For Vanjre, these reviews are good reminders to keep up what she is doing. “These guests could be in Santorini but they would say this (the meal) is the highlight of their trip. That’s a great review because you’ve helped to create something that has made someone’s trip better. For the hosts, they might like cooking and never had the opportunity to showcase it to the world but now they can,” says Vanjre. The post BonAppetour wants to be the Uber for dining experiences appeared first on e27.